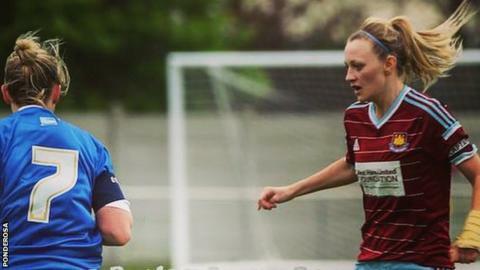 West Ham Ladies captain Stacey Little says she is "heartbroken" after she and five team-mates quit the club. The midfielder claims they left when she faced suspension after speaking out about how the side was run. "I am deeply hurt and disheartened. It's just not fair that I'm being blamed for everything," the 28-year-old told BBC Sport. Joint chairman Stephen Hunt said manager Marc Nurse had deemed Little "surplus to requirements". Nurse replaced former West Ham defender Julian Dicks as manager of the Women's Premier League South side in July. Little, who helped raise nearly £3,000 for the club last season through a crowdfunding website, told the BBC she has been punished for voicing her opinion. "We give all our time and money, we don't get anything for it, and we've been treated like that. I'd like to reiterate we walked, and were not released, as has been stated, because it's what we believe in," she said. "That's what hurts me most. I have put my heart and soul into that club. I've given blood, I've given sweat, I've given tears, it's been my life for six seasons. It chokes me up just talking about it, but that's what they've done to me, they've treated me so badly. "I'm just heartbroken to be honest. "I tried to get Julian Dicks in and that came off. I've spoken to him about things. He's checked to make sure I'm ok and he's given me support." West Ham Ladies are one place from the bottom of the 12-team Premier League South - the level below the Women's Super League - with one victory from five matches. Little said some players had been unhappy with the management, including changes in formation and selection, and she called on Nurse to quit at a team meeting. Six of them walked out when the captain was threatened with suspension, she added. After six years with the club, including nearly two as captain, Little took to Twitter to say she had been "treated disgustingly". Kelley Blanchflower, Lily Mellors, Emma Sherwood, Kerry Stimson and Kayleigh Xidhas are also leaving West Ham. West Ham Ladies, who receive support from, but are not affiliated to the Premier League club, are expected to release a statement at some stage on Wednesday. Joint chairman Hunt told BBC Sport: "A meeting was called by the manager for Tuesday evening to announce his decision to release a number of senior players, including Stacey Little, whom he deemed surplus to requirements. "The club is focusing its future on its main players such as Aditi Chauhan, the Indian international, and Giulia Ferrandi from Italy. "We also have a number of new signings being discussed, including players from Women's Super League teams." West Ham finished sixth last season before Dicks took a coaching role with the men's first team. Nurse told the BBC in August that he was aiming to win the division within two years.